Russian leader Vladimir Putin stands with a gun at a shooting gallery of the new GRU military intelligence headquarters building in Moscow during a 2006 visit. Last month, Putin said nations would eventually develop new types of weapons, including "psychophysical" weapon systems. Are we on the brink of an arms race over zombie ray guns? You might think so, based on the alarms being rung over Russia's potential to create mind-scrambling weapons. But the reality is that it'll be a long time before we have to worry about super-soldiers taking over our brains. The Americans as well as the Russians have been looking into psychotronic weapons for more than 15 years. You can find ample references to the subject on the Internet, including a feature published by U.S. News and World Report in 1997 and a report written for a U.S. Army publication in 1998. Such weapons purport to take advantage of the effect that pulsed microwaves can have on brain activity. Some researchers have reported an effect known as microwave hearing, in which a directed beam of radiation produces a sensation of buzzing, clicking or hissing in the head. "This technology in its crudest form could be used to distract individuals," according to a declassified Army review of non-lethal weapons. Theoretically, electromagnetic beams could cause an epileptic-type seizure, or involuntary eye motion leading to dizziness and nausea. Military researchers have also looked into using infrasound or laser beams to confuse or incapacitate a foe — but when you start going down this road, before you know it, you're talking about remote viewing, ESP and all the way-out concepts chronicled in "The Men Who Stare at Goats." The Russians have looked into these potential technologies at least as deeply as the Pentagon has, and you're hearing about zombie ray guns now because top Russian officials started talking about psychotronic weapons a couple of weeks ago. That has brought the subject back from the dead like a ... well, you know. "The development of weaponry based on new physics principles — direct-energy weapons, geophysical weapons, wave-energy weapons, genetic weapons, psychotronic weapons, etc. — is part of the state arms procurement program for 2011-2020 ... We will draft the proposals for the next program by December 2012." "The military capability of a country in space or information countermeasures, especially in cyberspace, will play a great, if not decisive, role in determining the nature of an armed conflict. In the more distant future, weapons systems based on new principles (beam, geophysical, wave, genetic, psychophysical and other technology) will be developed. All this will, in addition to nuclear weapons, provide entirely new instruments for achieving political and strategic goals. Such high-tech weapons systems will be comparable in effect to nuclear weapons but will be more 'acceptable' in terms of political and military ideology. In this sense, the strategic balance of nuclear forces will play a gradually diminishing role in deterring aggression and chaos." In the wake of Serdyukov's comments, folks dredged up Putin's reference to "psychophysical" weapons, added in some background about the research into electromagnetic mind control, and voila: the zombie ray gun. Last week, Britain's Daily Mail suggested that the guns "could be used against Russia's enemies and, perhaps, its own dissidents by the end of the decade." "When it was used for dispersing a crowd and it was focused on a man, his body temperature went up immediately as if he was thrown into a hot frying pan. Still, we know very little about this weapon and even special forces guys can hardly cope with it." Based on that comment, Tsyganov was apparently talking about a different kind of non-lethal weapon, an analog to the millimeter-wave "pain ray" that the U.S. military has been working on for years. As we noted a couple of weeks ago, the beam of radiation can be directed at a crowd, producing a severe burning sensation on the skin that forces the target to jump away instinctively. How fast can mad scientists work? There are a few problems with the pain-ray technology: It takes hours to build up enough power for the beam generator, and the system reportedly works only in clear atmospheric conditions. Nevertheless, testing of the "Silent Guardian" system is continuing, not only for military applications but also for use against oceangoing pirates and rioting prisoners. The bottom line is that Russia certainly seems to be on track to set up its own DARPA-like "Department of Mad Scientists," working on heat rays, mind-altering electromagnetic beams and heaven knows what else. But there's nothing in the comments from Putin and Serdyukov to suggest that the Russians are anywhere close to having psychotronic weapons. In fact, Putin makes it sound as if the next frontier in warfare won't be the zombie ray gun but the coordinated cyber-attack. And that's scary enough for me. What do you think? Please feel free to register your opinion in the unscientific poll above, and the comment space below. Update for 11 p.m. ET: A couple of commenters noted that the zombielike picture that originally accompanied this item had a caption that didn't quite square with the lore for the "Left 4 Dead" video game. The more I learned about the game, the more I saw that the picture really didn't fit. 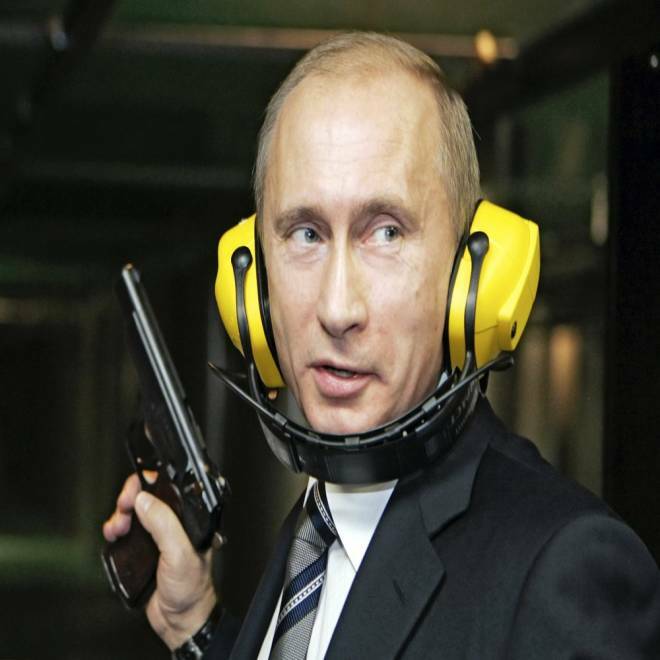 So I've put in the picture of a gun-toting Putin instead. Thanks to the gamers who pointed out the problem. If I ever play "Left 4 Dead," I'll want you on my side.